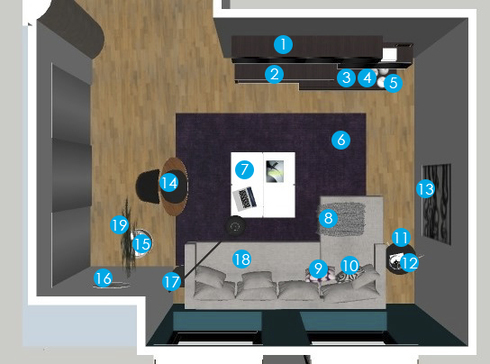 Help me design my Living Room! Since your room gets plenty of sunlight your color options are quite broad. A cool contemporary gray for most walls, with a warm taupe on the window wall to keep the space homey and cozy. For your main color, we chose to use gray and taupe because they are neutral and seen as elegant and classy. They compliment many colors such as white, blue, and yellow and work well as part of a color scheme in any room. Z TV Unit (TVM608 + TVT601 + ASM221 + ASM231) 4 Piece Set all in smoke wood: 60" Wide TV Unit C-Shaped Unit 3-cube Wall Cabinet with black glass doors 4-cube Wall Cabinet with black glass doors Discount link available to project holder only TVM608: W60" x H12" x D12") TVT601 W61" x H19" x D16" ASM221 W60" x H20" x D12" ASM 231 W80" x H20" x D12"
Iron Jack (White) Giant Cast Iron Jack Bookend Discount link available to project holder only It measures 7.5 inches diagonally from ball to ball and 6.5 inches diagonally from tip to tip. It weighs just over 3 pounds. Electric Blue (Electric Blue) Wind Farm in the Irish Sea North Wales. Discount link available to project holder only 12"x18"
Coffee Table with Drawers (White Lacquer) The coffee table with drawers functionality disguised as beautiful & simple design that comes in beautiful wood or hand-finished lacquer options. Discount link available to project holder only W40" H12" D40"
Rizzy Home Throw (White and Black) Made of 100% acrylic yarn, thin weave with finer combed threads and loom woven with fringe. Discount link available to project holder only 50" x 60"
TABLA (Purlple/Cream/Oyster) Hand embroidered, these pillows use the finest, hand-dyed New Zealand wool, with a cotton canvas overlay backing and a 5/95 down/feather insert. Discount link available to project holder only 18"X18"
Bishop Pillow (Black) Polyester filling and a 100% cotton sham. Discount link available to project holder only 20"x20"
Round Side Table (Black) The stylish details and design of the table matches seamlessly with all interiors. The legs are made of birch wood, and the table top comes with a smooth matte painted finish connected through finely made stainless steel base. Available in black or white. The feet of the table are self-adjusting. Discount link available to project holder only Diameter: 23.6" Height: 26.8"
Balance Adjustable Table Lamp (White) A sleek, stylish design table lamp featuring an adjustable cantilever shade designed with symmetry and balance Discount link available to project holder only Height : 21½" Base dimensions Length : 8" Width 4¾" Shade Diameter : 8"
Arch Floor Lamp (Marble base) An iconic shape of contemporary lighting, the Spectral floor lamp will bring sophistication and functionality to every room. The base is made from marble. Discount link available to project holder only H 88" W 81.6" Base D 15.7" Lamp D 12.9"
Cali Sectional (Grey Brick) The Cali sectional contains high density of foam in the seat and back cushions.The sectional is built with solid birch wood frame. The base of the sectional is finished with black powder coating steel. Discount link available to project holder only H 24.8" W 120" D 67.7" Seat H 15"